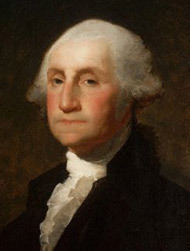 The first president, George Washington, was inaugurated at Federal Hall in New York on April 30, 1789. 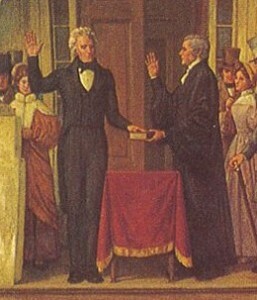 Washington repeated the oath, read by Chancellor Robert Livingston of New York, with one hand on the Bible: “I do solemnly swear that I will faithfully execute the office of the President of the United States and will, to the best of my ability, preserve, protect, and defend the Constitution of the United States.” Establishing a custom that has been followed by all succeeding presidents, Washington added, “So help me God” at the end. In eloquent Enlightenment form, Washington’s inaugural address spoke of “the Great Author of every public and private good,” “the Invisible Hand which conducts the affairs of men”, and civic virtue required for successful government. Washington needed only 135 words to complete the address at his second inauguration in 1793. Some 48 years later, President William Henry Harrison needed 8495 words to complete his address. During that address, which lasted some two hours in the cold weather, Harrison failed to wear a winter coat and developed pneumonia. He died a month later. The tradition of presidential procession of both the president-elect and soon-to-be-ex-president has its roots in the 1837 inauguration. On inauguration day that year, Andrew Jackson and Martin Van Buren met and traveled to the Capitol together in a wooden carriage built from the remains of the U.S.S. Constitution. This processional tradition has been followed by all presidents with the exception of outgoing-president Andrew Johnson, who in 1869 remained in the Capitol signing legislation until the noon expiration of his term. Andrew Jackson at the 1829 inauguration. 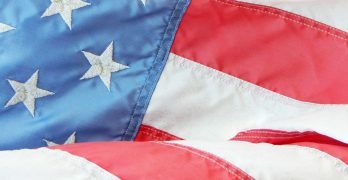 Under the Twentieth Amendment, the date of the Presidential Inauguration was moved from March to January 20, which falls a couple of weeks after the certification of votes of the Electoral College. The last president to be inaugurated in March after an election year was Franklin D. Roosevelt in 1933. After re-election in 1936, Roosevelt was the first president to be inaugurated under the new amendment on January 20, 1937. Roosevelt’s 1933 inauguration is also noteworthy because of what he did before his swearing-in. FDR went with his wife to St. John’s Episcopal Church for a church service on the morning of March 4, setting a presidential precedent of attending an inaugural-day worship event. Ronald Reagan broke with tradition in 1981 by having his presidential inauguration at the U.S. Capitol’s west front, which could hold more visitors than the normally used east front. Today, the presidential inauguration carries on the traditions of inaugurations past. To learn much more about presidential inauguration history, please visit the inauguration website of the Joint Congressional Committee on Inaugural Ceremonies.